The shirts are part of an effort by McMahon to blunt the urban vote Murphy needs in Hartford, Bridgeport and New Haven, where her workers also have left literature urging a vote for Obama and McMahon. Here’s a photo of said literature, which identifies McMahon not as a Republican, but as the nominee of the Independent party. It may be too late to make a difference. The New York Times‘ Nate Silver gives Democratic Rep. Chris Murphy a 95.5 percent chance of winning the seat being vacated by retiring Independent Joe Lieberman. This wouldn’t be the first time a blue-state Republican has mimicked a Democrat. In 2006, then-Maryland Senate candidate Michael Steele depicted himself as a Democrat at campaign events and in sample ballots handed out in Prince George’s county. 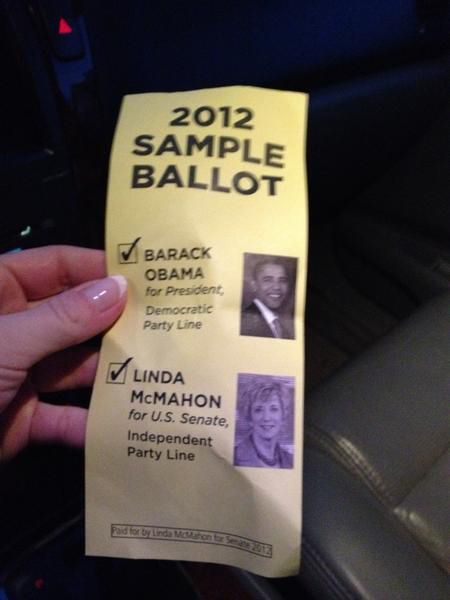 If McMahon really does support Obama, she should call her bank. According to FEC filings, she and her husband have given $150,000 to Restore Our Future, the pro-Romney super-PAC.